On the 14th (Sat), soothe aching muscles at some of the top local wellness centers and then kick back and relax at Patong Beach. For other places to visit, maps, ratings, and tourist information, read our Patong trip itinerary builder. Singapore, Singapore to Patong is an approximately 3.5-hour flight. You can also drive; or take a bus. The time zone difference when traveling from Singapore to Patong is minus 1 hour. In October, daily temperatures in Patong can reach 36°C, while at night they dip to 27°C. Wrap up your sightseeing on the 15th (Sun) to allow time to travel to Bangkok. 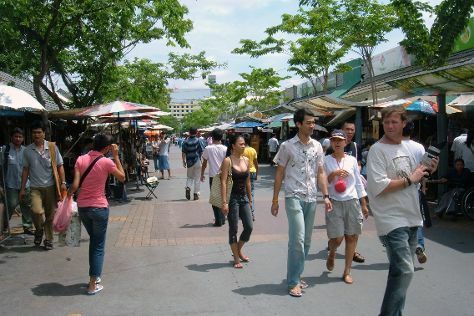 Head to Chatuchak Weekend Market and MOONRIVER by VJfor some retail therapy. There's still lots to do: explore the historical opulence of The Grand Palace, contemplate in the serene atmosphere at Temple of the Emerald Buddha (Wat Phra Kaew), soothe aching muscles at some of the top local wellness centers, and stop by Rajawongse Clothier. For other places to visit, ratings, more things to do, and other tourist information, read Bangkok trip itinerary builder. Traveling by flight from Patong to Bangkok takes 3.5 hours. Alternatively, you can drive; or do a combination of taxi and bus. In October, plan for daily highs up to 38°C, and evening lows to 30°C. Wrap up your sightseeing on the 18th (Wed) early enough to travel back home.